2. 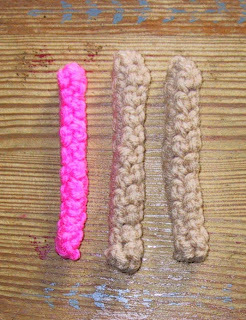 If you are making the I-Cord to be felted, I use an I (5.5 mm) crochet hook with worsted weight wool. 3. You will be working from the inside of a "tube". 4. You can work I-Cord over clothes line or drapery cord to make it stable. Round 1: With G hook ch 2, depending how big you want the I-Cord 4, 5 or 6 sc in second chain from hook. Do not join. Round 2-until desired length: Sc in back loop of next sc. Continue working sc in back loop until cord is as long as needed. Fasten off leaving a 4 inch tail. Weave tail through the sc from the outside and pull snug. I'm sorry... What is it?? What is it for?? I don't mean to sound rude, I am genuinely confused. The photos are of just a short piece, usually it is made long for handles on bags and totes. This is great!! Your pattern is exactly what I did, thinking I was incorrect, by other pattern standards(use a hdc in bl). So I guess you can make an I-cord with two strands, as I did, with a sc in bl. Your pattern comes out beautifully with two strands! I'm glad I found yuor site. I have more confidence in my I-cord. Cool! Thanks for posting this pattern. I've knitted I-cords, and am happy to see this crocheted version. Your patterns are beautiful, and I'm a novice at this. Is the cord on this page for things like the cord with the "Come on Baby Let's Do the Twist Baby Sack"? If not, can you tell me how you managed the one with that baby sack? No, this I cord would be too bulky for that. That pattern is a knit pattern and I used a knitted I Cord. But a simple chain the correct length and then slip stitched back to the beginning tail would work.